90% assembled - all electronics (servos, ESC and motor) pre-installed at factory, just complete the airframe assembly, connect up the servos, charge the battery and your ready to fly! Main wings are attached by 4 screws - easy to remove for access to servos and the EDF Fan unit! The F-86 was built as a counter to the very effective Mig-15, which was basically unmatched by UN aircraft at the beginning of the Korean war. 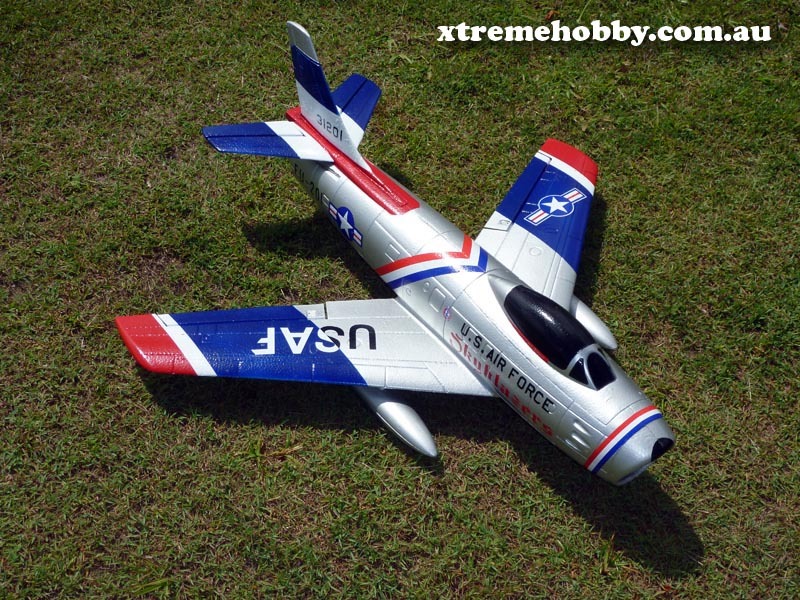 This Freewing F-86 "Sabre" is an amazing jet!, straight out of the box its performance is mind blowing, never would you believe such scale could be so Fast and perform as sweet as this Mini Jet does. The Jet has easy Hand Launch capabilities and lands easy on the supplied plastic skids. This kit is so easy to assemble you will be flying in less then 1 hour. The battery compartment features a Velcro hold-down strap to make sure the Li-Po doesn't move during aerobatic flight, and the battery/radio bay has more than enough room for your battery and receiver to fit with ease. As an added bonus we have added 2 Part, 5 Minute Clear Epoxy to help get you get in the air sooner. This is one of our best Daily Flyer's . It stores easy in the car and requires little to no effort to hand launch due to the fantastic thrust ratio. Get yourself an aircraft that will give 10 fold in return. Happy Flying!!. Title : Snappy performer. Great WOT low passes.